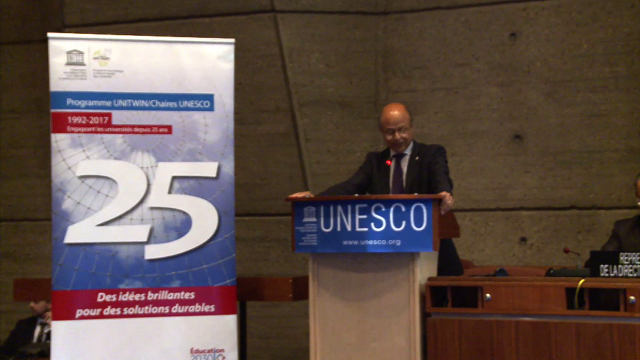 Celebration of the 25th Anniversary of the UniTwin/UNESCO Chairs Programme was one of the major side events during the UNESCO 39th General Conference, and it took place on 31 October 2017. This event was a great occasion for the representatives of over 200 UNESCO Chairs, coming from 48 countries from all the regions of the world, National Commissions and UNESCO, to reaffirm the commitment to support the development of our societies throughout our common work. The meeting was also an opportunity to discuss the achievements of the Programme since its launch in 1992 and the future role and contributions of the UNESCO Chairs and Networks for the implementation of the 2030 Agenda, in the context of UNESCO programmes. Authors and personalities: David Atchoarena, participant ; Qian Tang, participant ; Marco Antonio Dias, participant ; Olga Vasilieva, participant ; Georges Haddad, participant ; Charles Hopkins, participant ; Josep M. Vilalta, participant ; César Guerrero, participant. Production: UNESCO Education Sector, producer.